Il Porto reminds me of a good offensive lineman: just solidly doing their job over and over without much flash or fanfare. I’ve eaten at Il Porto twice in recent months and both times came away with the same attitude: good solid Italian-American comfort food. From the gnocchi, to the baked ziti, to the eggplant parmesan to the salmon picatta everything I have eaten or sampled there was good. Not sublime, not terrible, but solidly good. There is nothing fancy about their food; no avant garde foams or weird dishes, but what they do serve comes out just the way you expect Italian-American food to be. I was also very surprised how reasonable their prices were. Most entrees were in the $9-13 range. The other thing that really stood out was the service. It was impeccable both times we were there. The wine list is decent. They have a house red (which I did not try) and several wines by the glass. The only quibble I have is that they didn’t have many reds by the glass available. They did have a prosecco by the glass which was a pleasant find. I also really like the ambiance of the restaurant. It struck me as one of those neighborhood places you find in Boston or New York. I think it’s due to the fact that when you look out the front windows all you see are trees and residences and no other commercial property. It really makes it feel like a cozy neighborhood joint, which is exactly what it is! Drank the 2006 Domaines Schlumberger Riesling Les Princes Abbes with Easter dinner on Sunday. A good solid wine but didn’t blow me away, especially at $20 a bottle. Had a typical petrol nose with flavors of pineapple and kiwi. Very, very dry finish. I would rate it a solid 85. When I took the first sip after pouring I was really not impressed. As the meal wore one I came to enjoy it more and more. It really enforced what I’ve come to realize with Rieslings: they are truly food wines, especially the dry ones. What I mean by that is often when you just drink them by themselves they don’t come across as all that good. They don’t reach their full potential until you drink them with your meal. The food really seems to play off the flavors and harmonize some of the weirder notes that can be off-putting when they are on their own. What do you think? For me a little oak goes a long way. I’m especially sensitive to the amount of oak in white wines as all too often the oak seems to overpower the flavors. Regular readers will know I have a strong dislike of the big, buttery, oaky California-style Chardonnay. As far as I am concerned if I wanted that much oak I’d just chew on a stick. So when I’m choosing a white I usually tend to gravitate towards to unoaked bottlings. 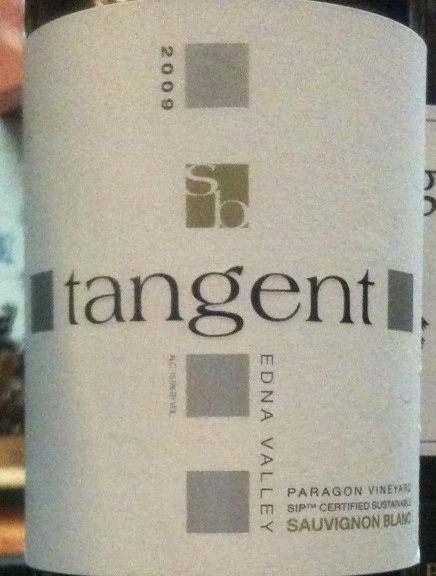 If your palate is like mine I’d like to recommend the 2009 Tangent Paragon Vineyards Sauvignon Blanc. From the Edna Valley in California this wine looks away from the new and towards the old world. This is the second vintage of theirs that I have tried and I think this one is better than the ’08. Lots of tangerine and lemon flavors, all wrapped inside nice flinty acidity. Delicious and right what I am looking for in a white. I paid $14.99 for this from the Frederick Wine House. I rate it a solid 90. Just wanted to make quick post to let everyone know how I had a wine Sunday evening that we both loved. It was the 2009 Chateau Ste Michelle Riesling from the Columbia Valley in Washington State. I would call this wine off-dry as it had some sweet notes but definitely not too much. It looked as pale as water in the glass but the explosion of fruit was awesome with tons of peaches and apricots. The finish lingered on and on. A delicious wine and a really great value. I really enjoyed just sipping it on its own. We scored it an 89-90. They make a lot of this so you should be able to buy this almost everywhere for about $10. Just make sure its the 2009. Also don’t confuse it their other Reislings: Dry Riesling and Harvest Select Riesling which I haven’t tasted. Quick post: Gary V whose Wine Library TV widget has graced my pages for years did a review of a prosecco with a screw top (!?!). He says that more and more bubblies are considering screw tops. Has anybody seen any? To see the review go down to the WLTV link on the bottom right of the blog and go to episode 938. To all those who inquired thanks! I am fine. Sorry for the light blogging. I’ve done a bunch of fun food and wine related things this Summer and Fall but just been too busy to write about them. Life just keeps getting in the way. I fully intend to let you guys know about some of them. A few days ago Mrs. F and I had a rare childless evening. So we decided to try someplace new. Any place with wine bar in the title gets our vote so off we went to the Shab Row Bistro and Wine Bar on East Street in Frederick. This newer restaurant was once the tasting room for Frederick Cellars, but they split the building. Now Frederick Cellars has its facilities completely on one side and the new restaurant on the other. The owners have made some changes and the eating area is stylishly decorated with muted earth tones, pictures by local artists and a zinc bar. They also have a four table outdoor dining area overlooking East street, but on the day we went it was just too darn hot to sit there. They are serving a limited menu right now, but their website indicates that they plan to expand it in the fall. We had a cheese plate, the crostini, a caprese salad special and the vegetable flatbread. Plenty of food for two moderately hungry people. The food was quite good. They have a nice selection of cheeses to choose from and the three spreads that came with the crostini were excellent. The flatbread was nice and I really appreciated that the vegetable topping had not been cooked into mush and was still crispy and flavorful. The service was also very attentive. They had about 40 wines by the glass and Mrs. F and I had fun picking and sampling a variety. While I thought the food prices were a little on the expensive side the wine prices were excellent. Everything they had by the glass was available in 2 or 6 ounce pours and the wines by the bottle were really a good value. Most restaurants sell wine by the bottle for double or even triple retail. Shab Row’s prices were significantly less than that. Furthermore they have a wine store in the back and they will pour you anything there for a $9 corkage fee. I didn’t explore the wine store as we were having too much fun with the wines by the glass. Their website also lists their happy hour times which look worthwhile. Bottom line: If you think of this as an excellent place to drink some wine with some decent finger food on the side you won’t be disappointed.